Cluster truck Switch Edition: A review, chickens not included. The Nintendo Switch has really exploded in the past year and in a very un-Nintendo like way has quickly become a new home for indie game developers. Also getting on board is tinyBuild who enthusiastically announced a bundle of games would come to Nintendo Switch in the next few months. Earlier we saw “The Last Station” as their first release which we thought was a solid game, especially with the DLC content included as a bonus. And last week we saw the arrival of this game, cluster truck. Cluster tuck is a game where the concept of the game “the floor is lava” you probably played in your house when you were younger, where you jump from furniture piece to furniture piece trying not to touch the floor, and added trucks. Lots and lots of white trucks. Conceptually think of it as if Mirrors edge and burnout 3 crash mode had a baby. 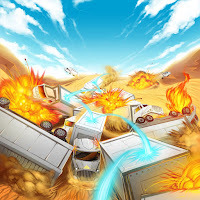 Your aim is to jump on these truck, driven by the world’s worst drivers, while trying not to hit the floor or walls along the way to the finish line. There are trucks and scenery flying everywhere. It is not an easy task that gets more challenging as you progress through the levels. Over time you will also get new abilities such as grappling hooks and time-control to help you overcome those increasing challenges. Let’s get this out in the clear from the start: Anything you touch that is not floor or truck instantly will result in a big “LEVEL FAILED”. It can happen very quick and easy and expect to see it a lot. 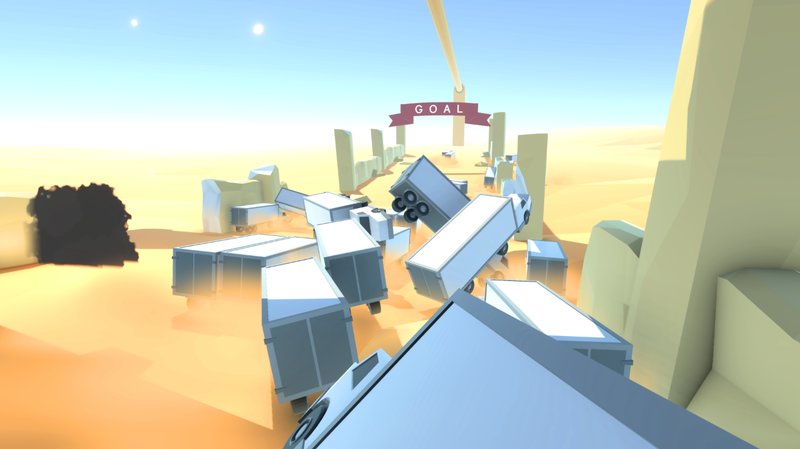 That said the gameplay is simple, the game plays in first person, when the level starts the trucks are running at full speed towards a finish line. Unfortunately they are driven by insane maniacs and not all of them will make it to said finish line, making it necessary for you to jump from white truck to white truck, avoiding being stuck in a collision. The aim is to make it to the finish line as fast as possible for the most points and there are bonus points to earn if you do stunts, such as high air jumps or pushing of a high flying truck in the middle of a crash. You progress through multiple levels each having multiple stages. 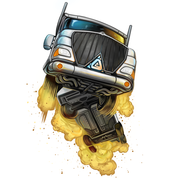 Throughout you gain new abilities that will help you deal with the increasing hazardous environments and increasing insane driving habits of the trucks. "- think of it as if Mirrors edge and burnout 3 crash mode had a baby"
The concept is pretty cool and crazy, but the execution, at least on the switch is a bit lacking. Especially the controls are hard to control and in a game where you need precision aiming in order to make it through the challenges. First of all the sensitivity of the camera is set way to high by default, but a quick change in options fixes that. However we still have the issue that the camera control is done by the right analog stick and the jumping is mapped to the A button. You can imagine that a lot of thumb movement is involved to keep switching between jumping and camera movement and it just does not work that well. I looked for a customizing option to for instance map jumping to a trigger button as that would make a big difference or perhaps turn on gyroscopic aim controls. Neither were available and it is a big oversight causing hand cramps and hindering gameplay. Hopefully this is something that can be patched in the near future. What is interesting is that even though some parts of the levels are pre-set/scripted such as when a truck jumps up in the air or veers to the side, it seem that the physics are not, resulting in slight variations each time you try a level. I could not tell in how far my decisions had effect on the level playing out , but it sometimes felt it did have an effect. Cluster truck is packaged in a minimalistic look with fairly barren simple looking landscapes and white trucks, lots and lots of white trucks. In some way the style had me think of mirror’s edge a bit. Little in the way of textures and a clear, simple representation of where to jump. You do not see your hands and feet though. You are just a disembodied head floating through the air. When hanging on the back of a truck this is a bit awkward. A hand would make it a bit easier to see what you are doing. The frame rate is high and I did not notice much if any slowdown while playing. A “LEVEL FAILED” is quickly dismissed with a tap of a button and you are back to playing no loading involved. The music is a bit monotonous after a while and jusy like its graphics the audio effects are simple and uncomplicated engines, explosions and crashes. Each level is a big jumping puzzle, “Frogger” on steroids if you will. Sorry kids I mean off course “crossy road” ;) that you have to digest and figure out in order to pass. Personally, I feel that cluster truck is not worth cost of $15. There are 90 levels , but you either get stuck in frustration or you breeze through it in a couple of hours with not much desire to do it again. At a slight lower price and better controller options this game could be worth a look. But I had the kids check it out and they had other options. So let me pass the word now to Kat. Hey guys! As I’m sure you wanna figure out if Cluster Truck is a good game or not quickly, I’ll keep this short and sweet. Cluster Truck is very fast paced and the mechanics are a little too sensitive, but I’m pretty sure the second part is a purposeful game mechanic. I wouldn’t recommend this to little kids, just because it’s very difficult and fast paced, they’d probably get mad and give up very quickly. But I believe it’s perfect for teenagers! As a teen and gamer myself, I get really into games like Cluster Truck. It’s definitely a challenge that I enjoy. I can also imagine this as a bonding experience seeing a group of parents huddled around the TV watching as their kids fail or succeed. Have a good day indeed. See you next time.